This guest post is by Dave Tindell. Photos are our own or as credited. A couple years ago, I was reading the latest issue of Men's Journal magazine, which focuses on exploring the great outdoors. 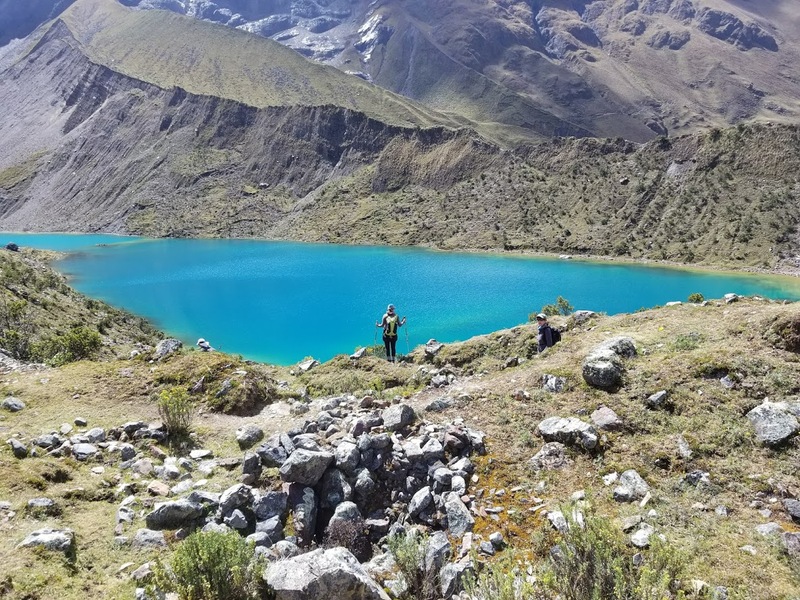 They always feature articles about adventure travel, and one of them caught my eye. Sue and I had been talking about taking an adventure trip to jointly celebrate our 60th birthdays in the summer of 2017. I handed her the magazine and said, "How about this one?" The piece was a short one, about trekking the Salkantay Trail through the Andes of Peru. She read it and said, "Sounds good." It turned out to be more than good, much more. It was, in many respects for me at least, the challenge of a lifetime. We never really considered other options for the trip. There was something about the Salkantay that seemed to capture us, just from the photos and videos on the website of Mountain Lodges of Peru. We never really considered any other outfitter, either, as Mountain Lodges had an excellent reputation, which we would discover was well-earned. 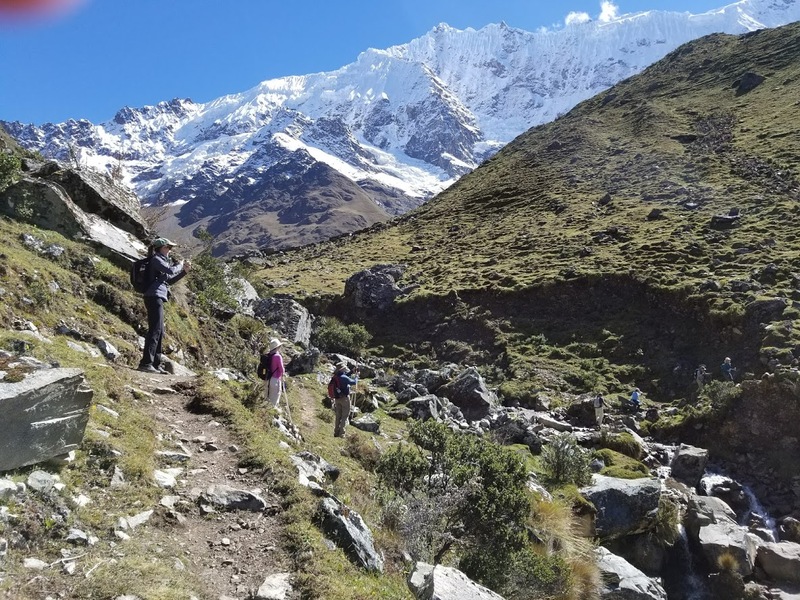 Other outfitters would include actual camping along the trail, but our experience in Tibet the previous year, when we stayed four nights at a camp in wood-floor tents with electricity and coal-burning stoves, had convinced us that while we were certainly willing to undergo the rigors of the trek, we wanted to spend our nights in relative comfort. We departed our home in northwest Wisconsin on the morning of Saturday, June 10th, for the drive to the Minneapolis airport and the first leg of our trip, a flight to Atlanta. In late 2014 we had made our first visit to South America and knew how to prepare for the jet lag. 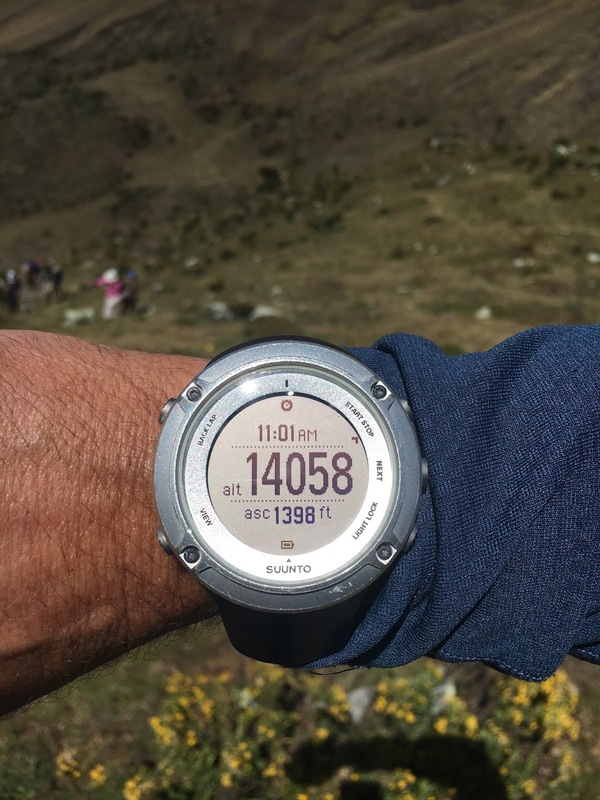 The time zone changes which make travel to Europe or Asia somewhat formidable are not an issue when going south; Peru, in fact, is in the same time zone as Denver, and since it doesn't have Daylight Saving Time, we would not have to change our watches at all from Wisconsin time. The first flight went smoothly, and after a short layover in Atlanta we bade farewell to the U.S. and headed for Lima, Peru, where we arrived shortly after midnight on the 11th. We had never been to Peru and I for one expected it to be more of a third-world country than it turned out to be. 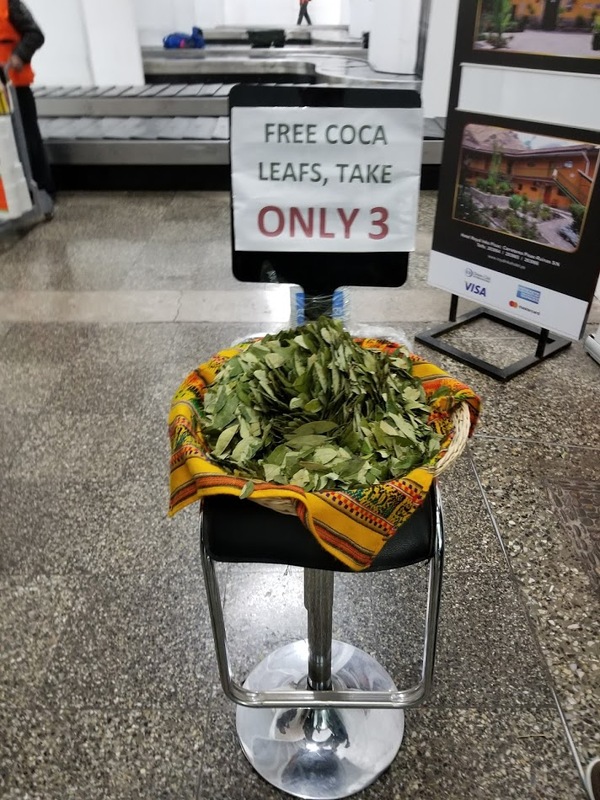 The Lima airport was modern and comfortable, making our three-hour layover there as tolerable as one could expect in the wee hours. 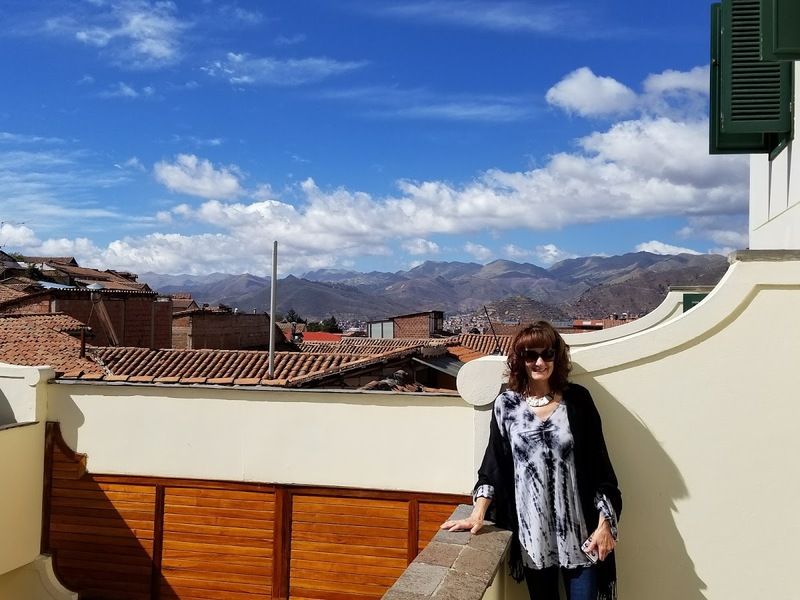 Finally, we boarded a flight for our final destination, the southern Peruvian city of Cusco. source of the alkaloid known as cocaine. 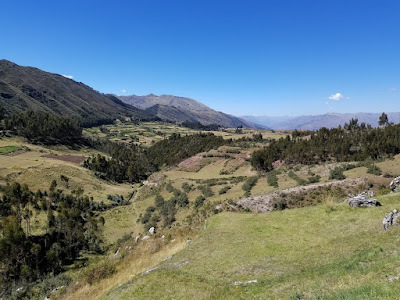 We had been advised by Mountain Lodges to arrive in Cusco a couple of days in advance of the start of the Trek, in order to acclimate ourselves to the altitude. 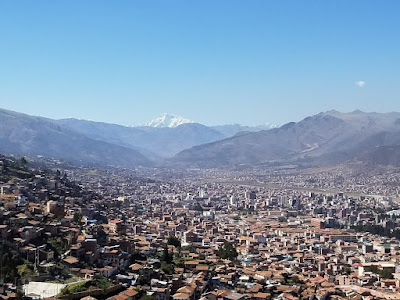 Cusco is a city of over 400,000 inhabitants and sits on a plateau at over 11,000 feet. By comparison, Denver is at about 5,700 feet. 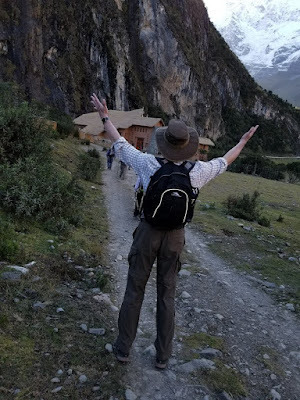 We had both experienced some slight headaches when we were in Tibet last year, and now we would be going even higher, but as it turned out, we would have no problems here in Peru. Sue had booked us for the Hotel Belmond Monasterio in Cusco, and we were able to check in right after our arrival and sleep for a few hours. We had both slept through most of the six-hour Atlanta-Lima flight and again during part of the final, 90-minute hop to Cusco, so by the time we rose in the hotel, we were pretty refreshed. Sue had arranged to be given a tour of the property and it was well worth it. The hotel would quickly become one of our favorites among our travels throughout the world. The hotel began as a Catholic monastery established by the Spaniards in the 16th century. 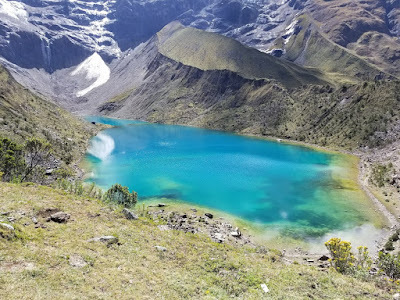 Peruvian culture today is a mixture of Spanish and ancient Inca, the peoples who inhabited this land before the arrival of the European conquerors. Our guides would later point out that the Inca civilization was only the latest in a long line of native civilizations, going back thousands of years. But when the Spaniards arrived around 1534, everything changed, and quickly. The Spaniards imposed Catholicism on the natives by force of arms, and proceeded to destroy many Inca religious sites while building cathedrals, churches and monasteries where the Catholic faith was taught and practiced. 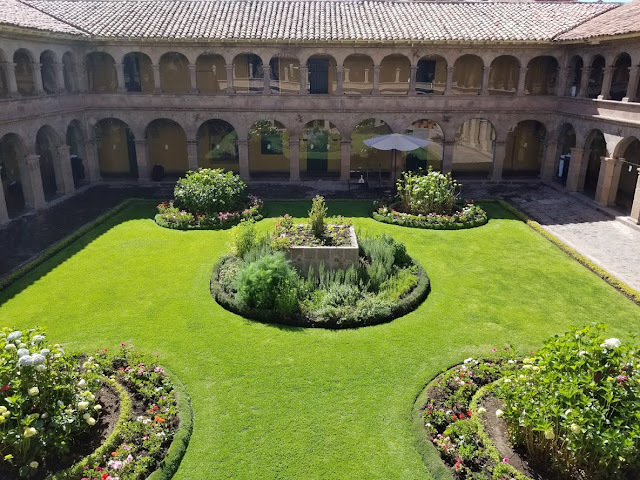 Today, the Monasterio has an undeniable charm that is due to its Spanish influence, and yet, like much in Peru today, the Inca influence is there, too. 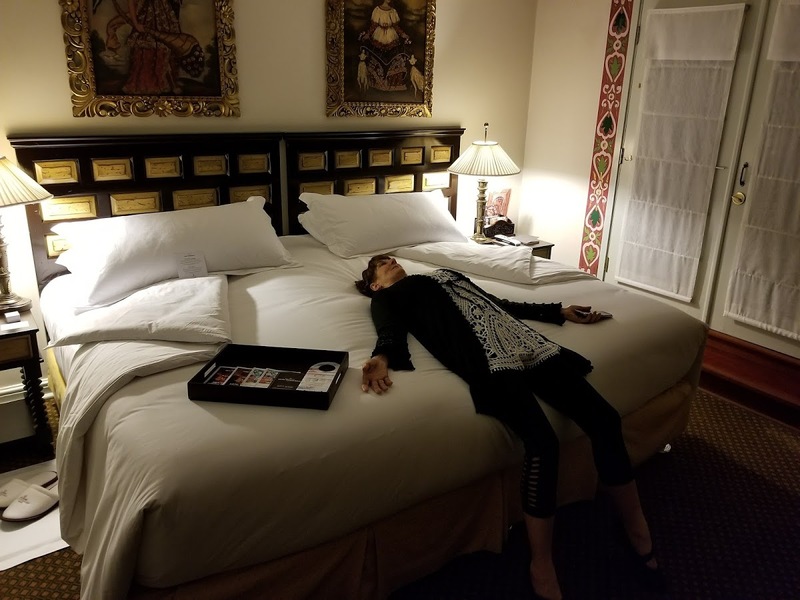 After some 20 hours of travel, we were pretty weary when we arrived at our hotel in Cusco. But after some shuteye, by late morning we were ready to start enjoying our hotel. Here's the view from our balcony. The hotel's courtyards were meticulously groomed. For breakfast and lunch, diners had the option of outdoor seating. 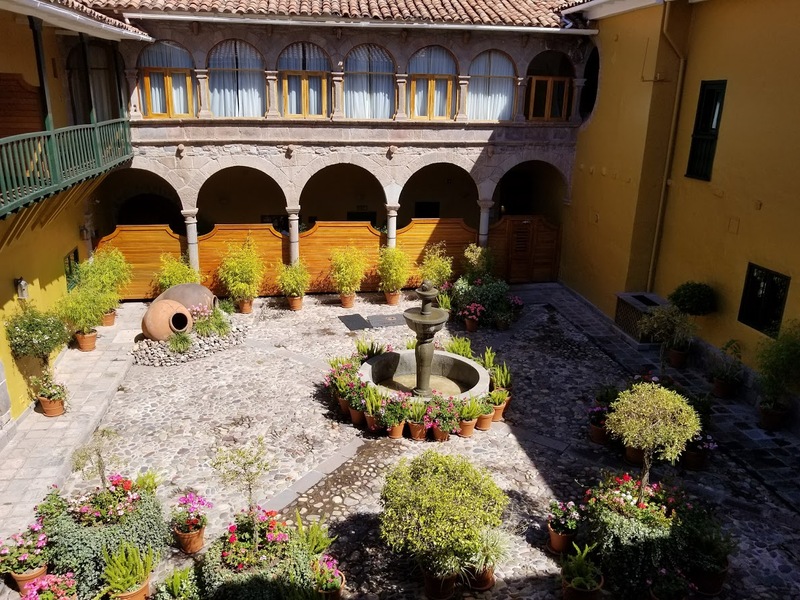 Some courtyards were tucked away and offered solitude as well as beauty. 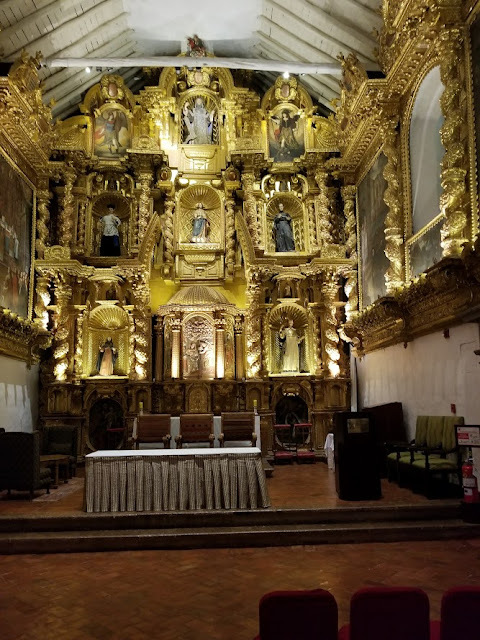 Indoors, the gorgeous Spanish architecture and decor was on display. The hotel has preserved the monastery's 16th century chapel, where many weddings are held. After our tour, we had lunch and then set out for our first exploration of downtown Cusco. We were only a couple blocks from the city's main square, Plaza de Armas. 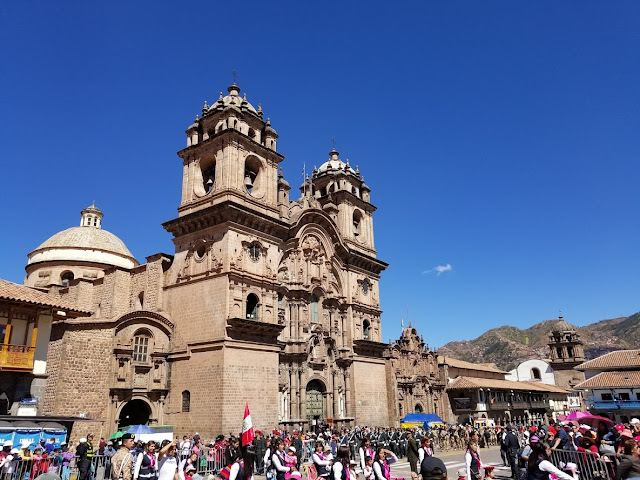 We soon discovered that Cusco is a city where parades and celebrations are common, and there was one underway today. 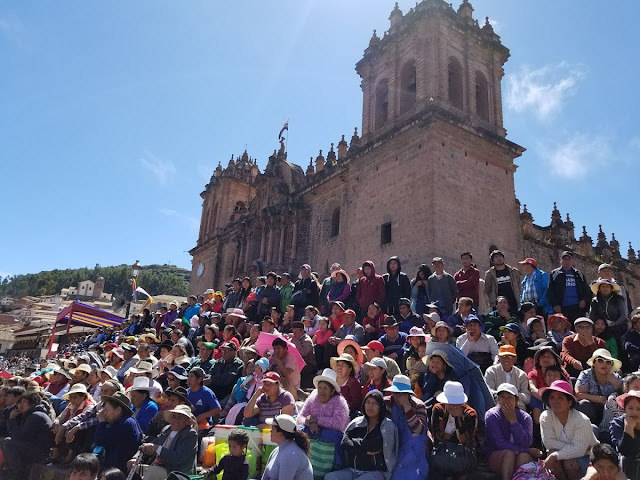 Catedral de Cusco's steps were filled with Peruvian parade-watchers. 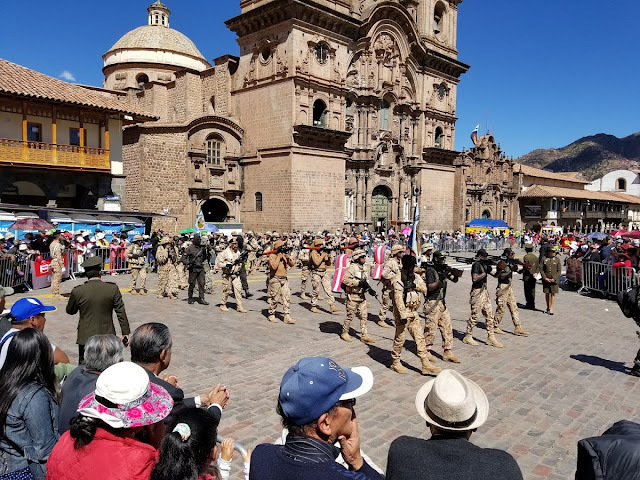 In addition to native dancers on this day, the Peruvian Army showed up. This is a special forces contingent. word got from Rome to Cusco, it was done. There were dancers everywhere, and not just in the main parade, but on side streets. Here's a video of one energetic group: Cusco dancers. 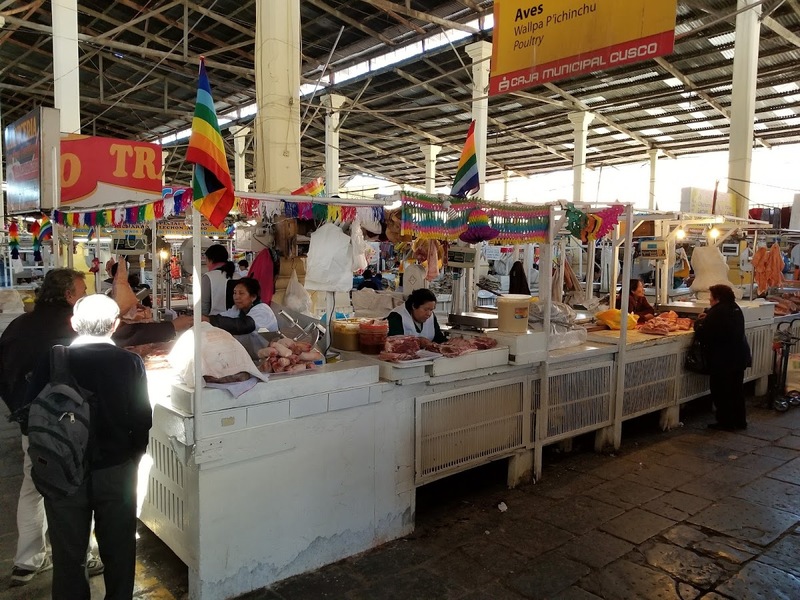 We had been told at the hotel that we should not miss San Pedro Market, which was a few blocks past the plaza. On our trip to China, we had marveled at Lanzhou's renowned Night Market. San Pedro is even bigger. The Arch of Santa Clara, near the church of the same name, with San Pedro Market a block beyond. they are popular with Peruvians. 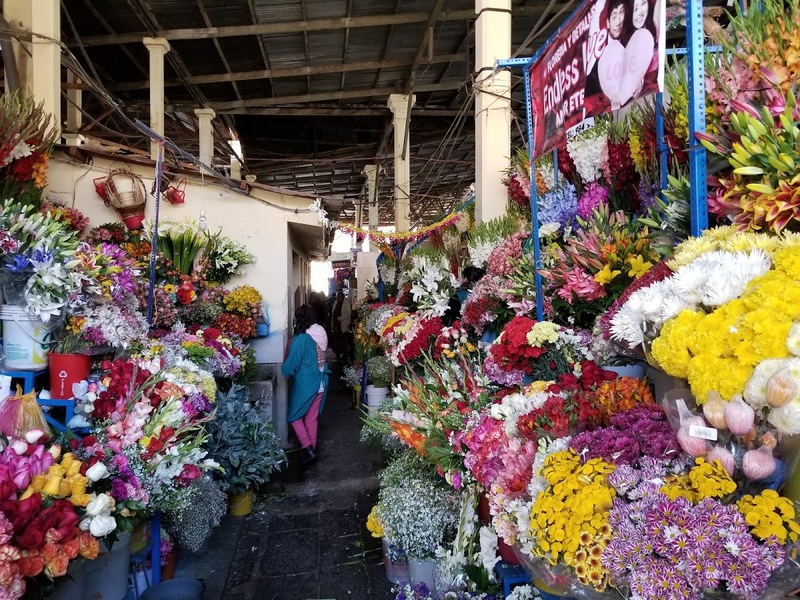 The selection of flowers was pretty extensive. We weren't quite sure what these were, and didn't ask. 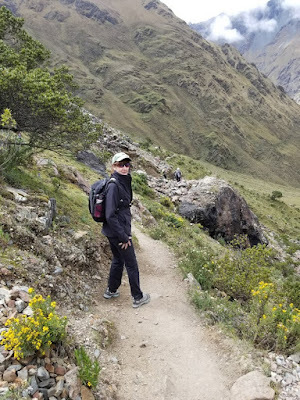 We continued our exploration of Cusco by walking a few more blocks to Quricancha, sometimes known as the Temple of the Sun. 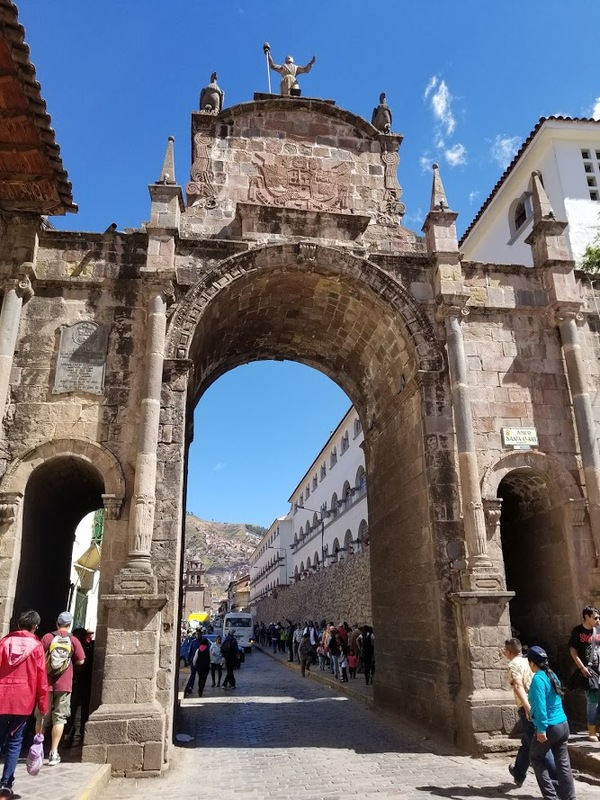 Like much of the architecture of Cusco, this was originally of Inca construction but only its base remains. 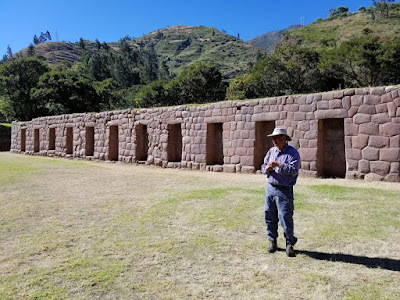 The Spanish conquistadors destroyed much of the native Inca buildings and built their own structures on their bases. The original structure was built by the 15th century Inca king Pachacuti. 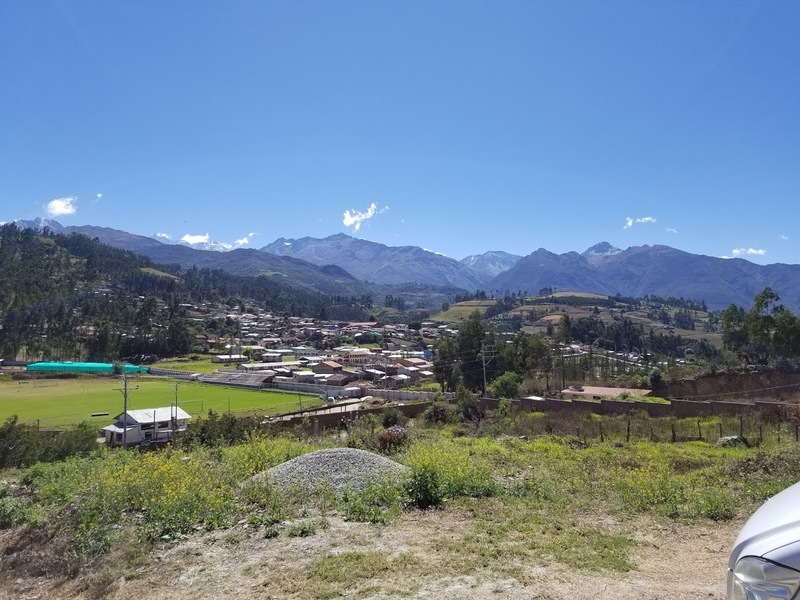 He's credited with expanding the Inca empire throughout much of northwestern South America. By the time of the arrival of the Spaniards, the Inca controlled nearly 800,000 square miles of territory, quite probably the largest land empire in the world at the time, with Cusco as its capital. 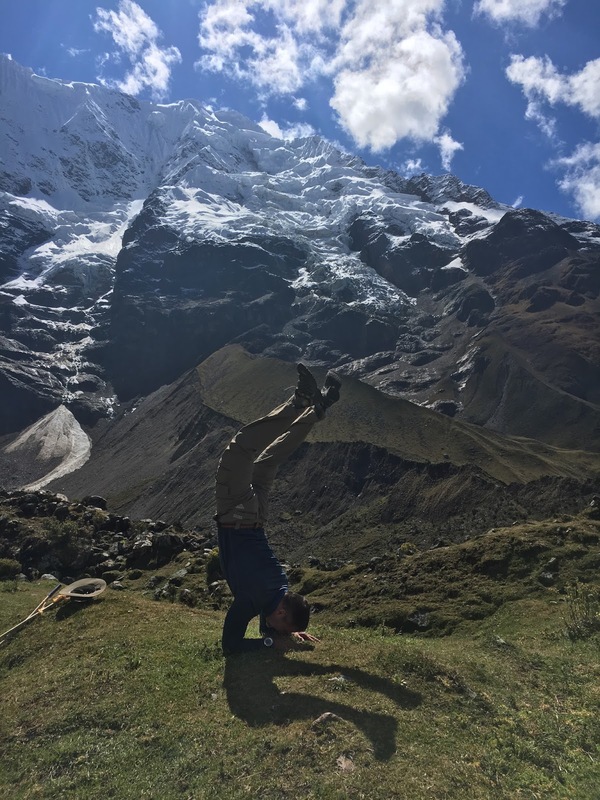 Quricancha was dedicated to the worship of Inti, the sun god of the Incas. Its rooms were said to be lined with gold and filled with golden statues and artifacts, all of which was captured by the Spaniards. After looting and destroying the temple, the Spaniards built the Church and Convent of Santo Domingo on its base. Dave in front of the Convent of Santo Domingo. 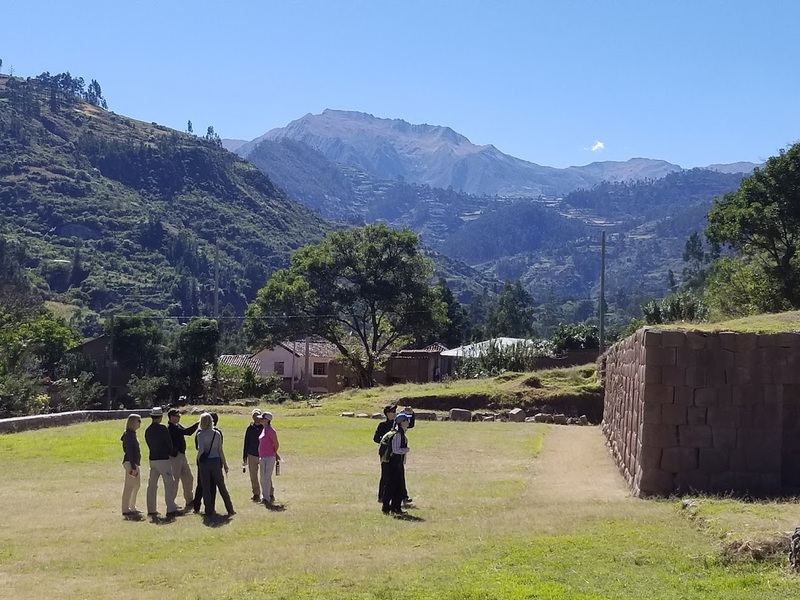 The original Inca base of the temple dominates the large courtyard. It had been a pretty long day for us, so we made our way back to the hotel and changed for dinner. Sue's birthday was the next day, and we celebrated early with dinner in the Monasterio's magnificent dining room. All in all, a perfect way to end our first day in Peru. 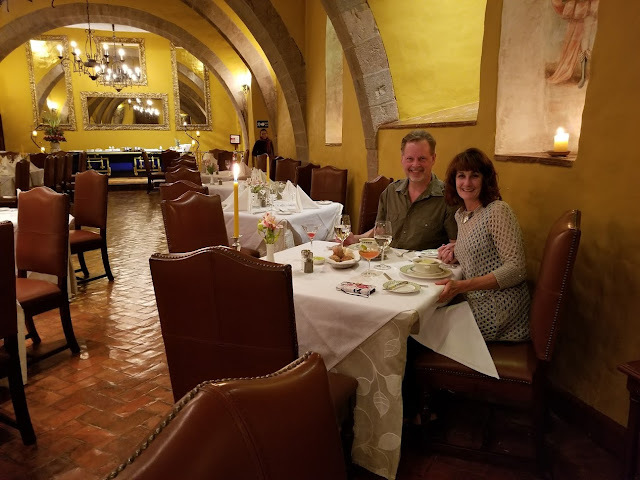 Dinner for the birthday girl was celebrated with style at the Monasterio. 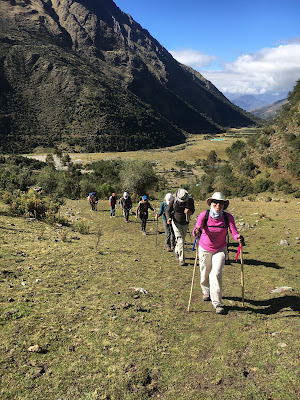 We would have a full day in Cusco the next day, culminating in our orientation meeting with Mountain Lodges of Peru and our first meeting with our fellow trekkers. 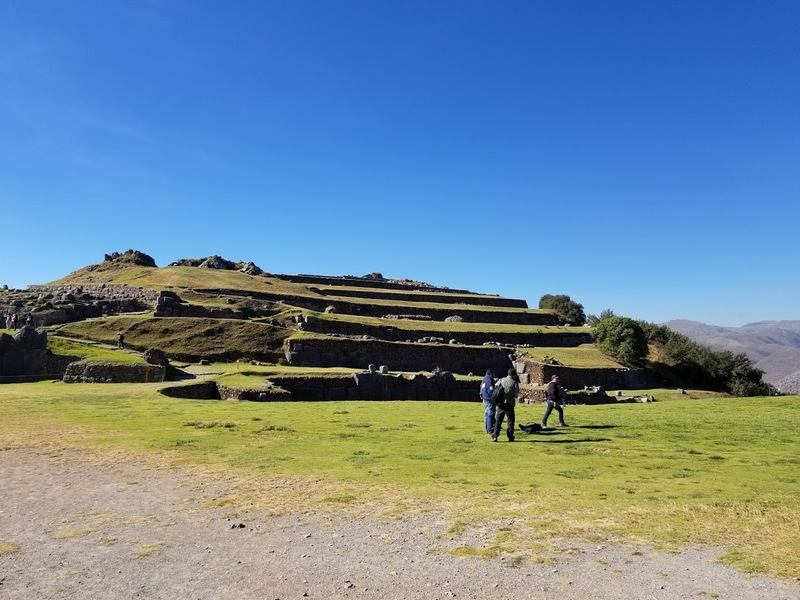 But we were going to make the best use of the day by touring the nearby Inca ruins, as we continued to learn more about the fascinating culture of the early Peruvians. 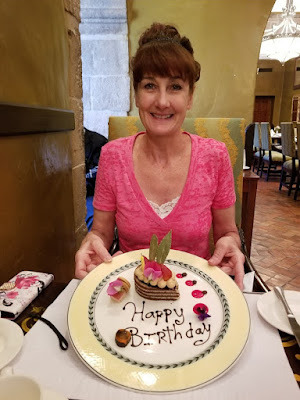 Our day began with breakfast at the Monasterio, where the birthday girl was presented with a special treat. 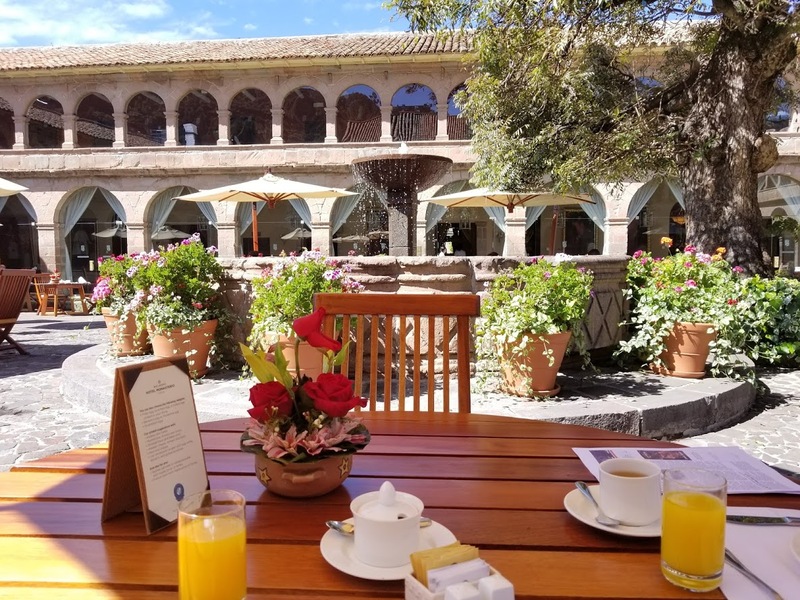 With the help of the hotel concierge, we hired a car and a guide to take us to the Inca sites around Cusco. 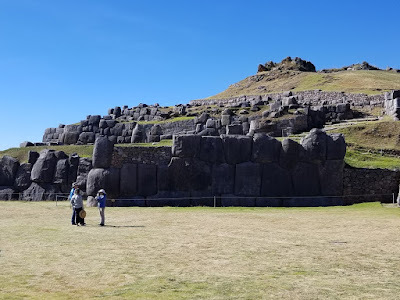 Our first stop was Saqsayhuaman, on the northern outskirts of the city. 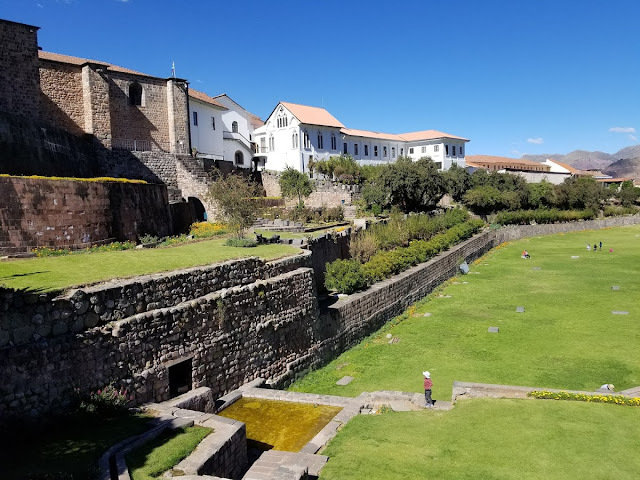 This was a citadel first built by the Killke, a predecessor culture to the Inca, and then expanded and fortified by the Inca around the 13th century. 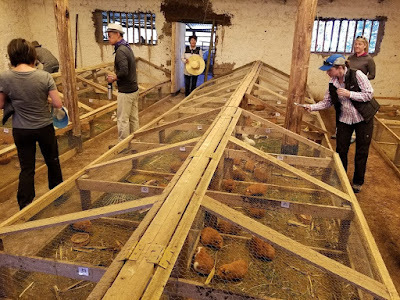 The Spaniards who first visited the complex described a series of storage rooms filled with armaments. The most impressive feature of the complex is the walls, which are all that remain after the Spanish conquest. The huge stones are so intricately interlocked that in most cases not even a sheet of paper can be inserted between them. 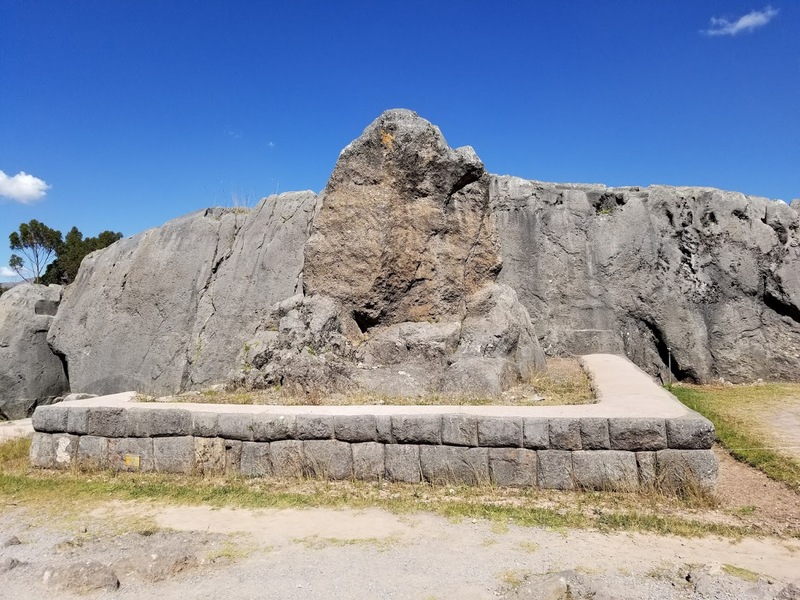 The stones are native andesite, and the largest is estimated at nearly 200 tons in weight. 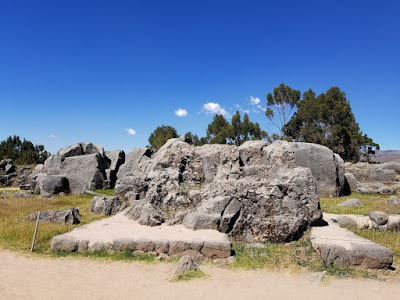 The exact means the Inca used to construct these sites are still not known, although observations by the Spaniards suggested that the stones were quarried and then transported to the sites by work crews numbering hundreds of men. The Inca did not use the wheel, so it is assumed that the stones were dragged over logs, which were used as rollers underneath the stones, and then at the site they were pulled up ramps. Without the wheel, they could not use pulleys, so their method of raising individual stones to use as lintels, for example, are also not completely known. As we would find out later at Machu Picchu, the tools used by the Inca are still not entirely understood, either, as the metals they used, primarily gold and silver and tin, are not conducive to carving stone. The Inca also did not have a written language, so there are no records of their construction methods, or anything else they did, for that matter. 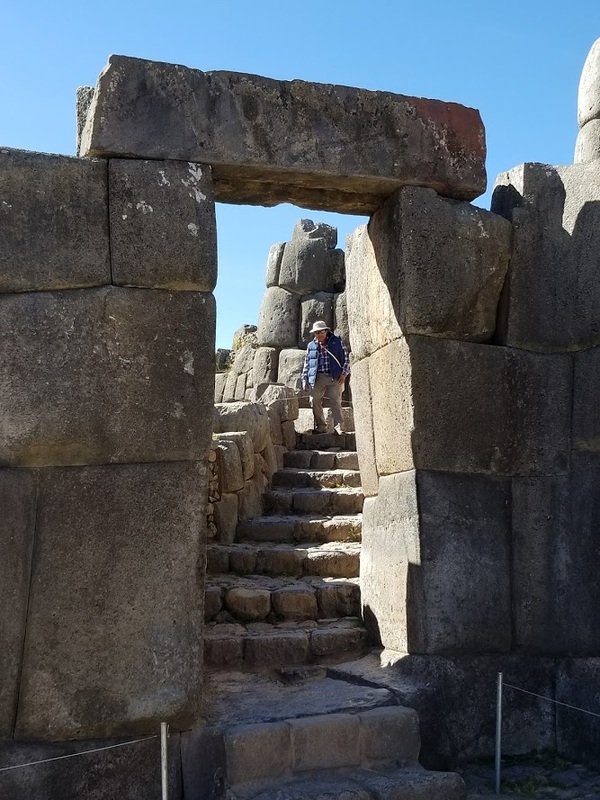 Whatever the means, the Inca were impressive stoneworkers. The view of Cusco from Saqsayhuaman was impressive indeed. Plaza de Armas is in the center. Looking to the southeast, where Ausungate rises to some 21,000ft. 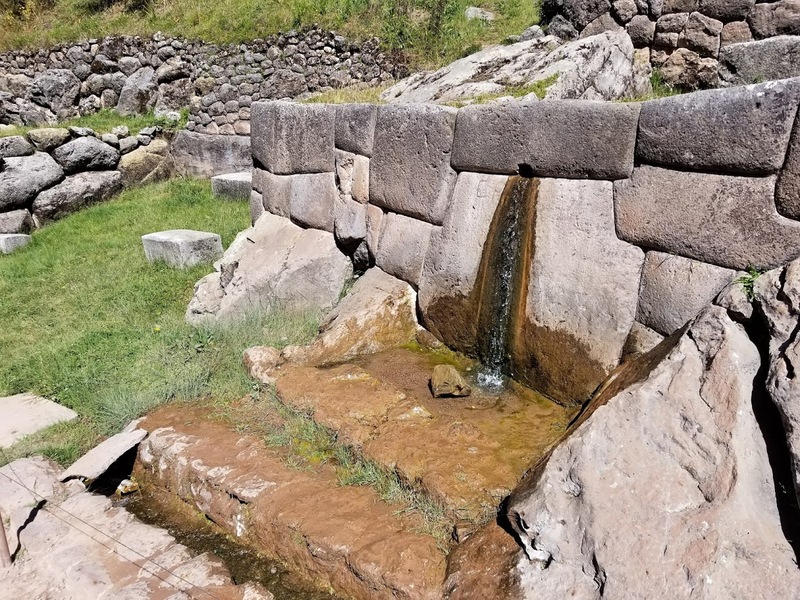 We moved on to Tambomachay, a site that probably served as a religious temple where Inca royalty would go to be purified in the spring waters. 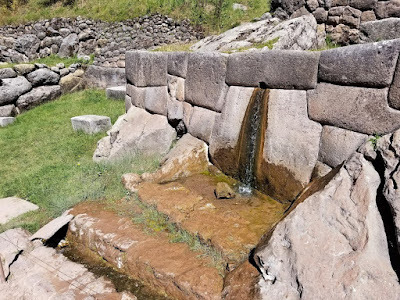 The Inca were industrious in building aqueducts throughout the mountains to supply villages with drinking water. Some of them are still in use today, several hundred years after their construction. 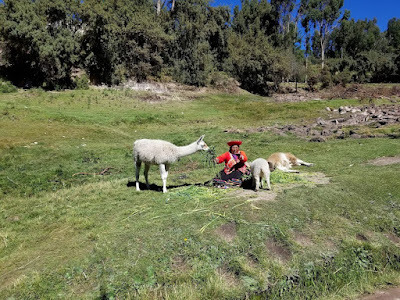 will bring llamas to tourist areas and charge for a picture to be taken. This gal clipped me 1 sol (about 30c US) for the photo. 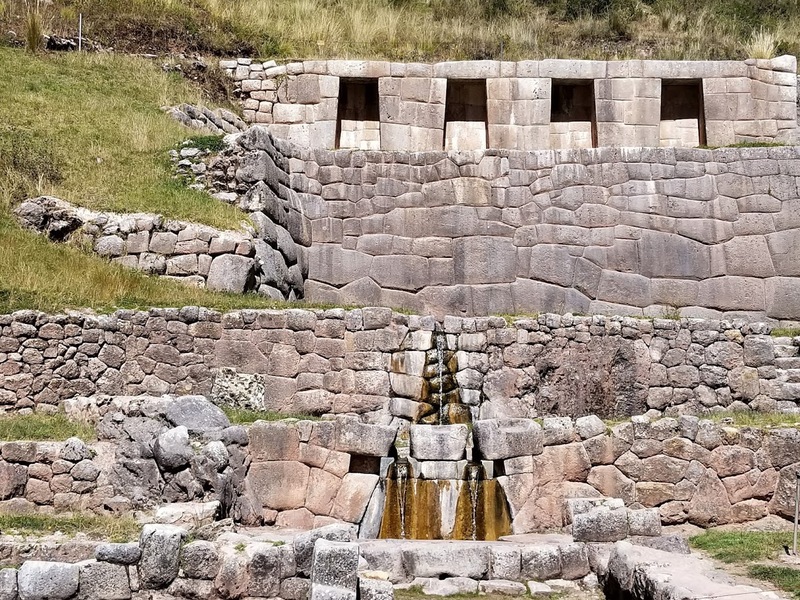 Once again, the Inca stonework is impressive, and so is their plumbing. 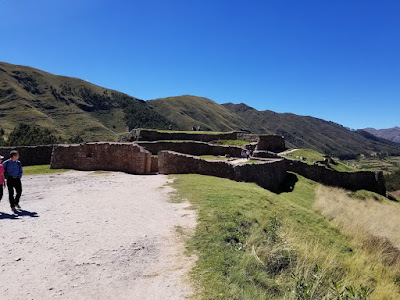 Our next stop was Puka Pukara, also a fort but much smaller than Saqsayhuaman. It is thought to have been built rather late in the Inca period and used as a fort because of its location overlooking the city and on a prominent trail. The stonework here, while still impressive, is more haphazard, perhaps indicating it was built rather hurriedly. 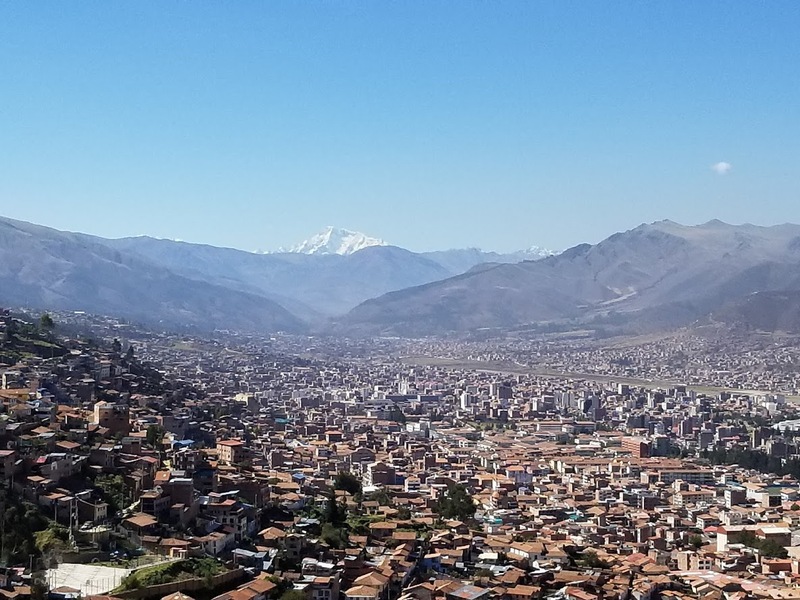 The view toward Cusco from Puka Pukara. now a staple of Peruvian livestock production. 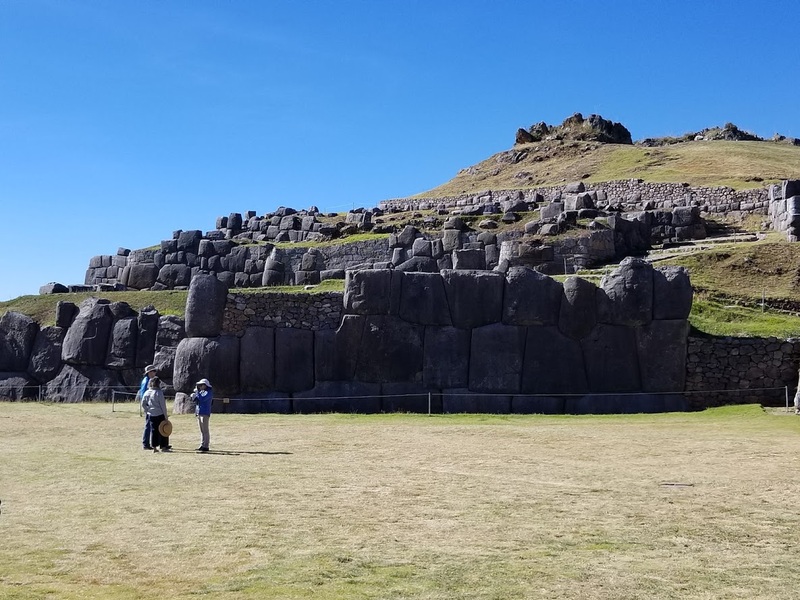 The final stop on our visit to Cusco-area ruins was Q'enqo, and our guide had saved the best for last. 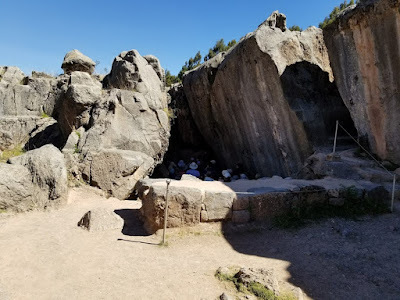 This was a religious shrine, and a place of ritual sacrifice and mummification. In the native Inca language, Quechua, the name means "labyrinth" or "zig-zag." 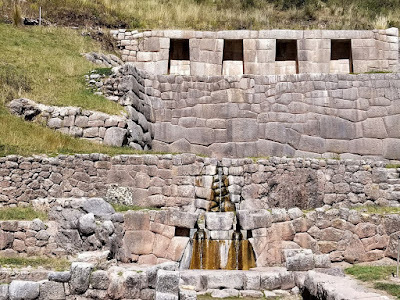 A small canal runs through the structure and it is assumed it was used to carry liquid, perhaps blood, as part of the ritual. Why did the Inca practice human sacrifice? 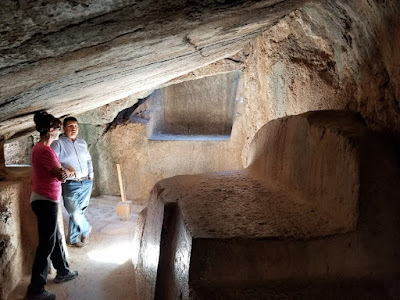 Nobody really knows for sure, because as mentioned they did not keep written records and we can't really be sure what they told the Spaniards in the 16th century was accurate. 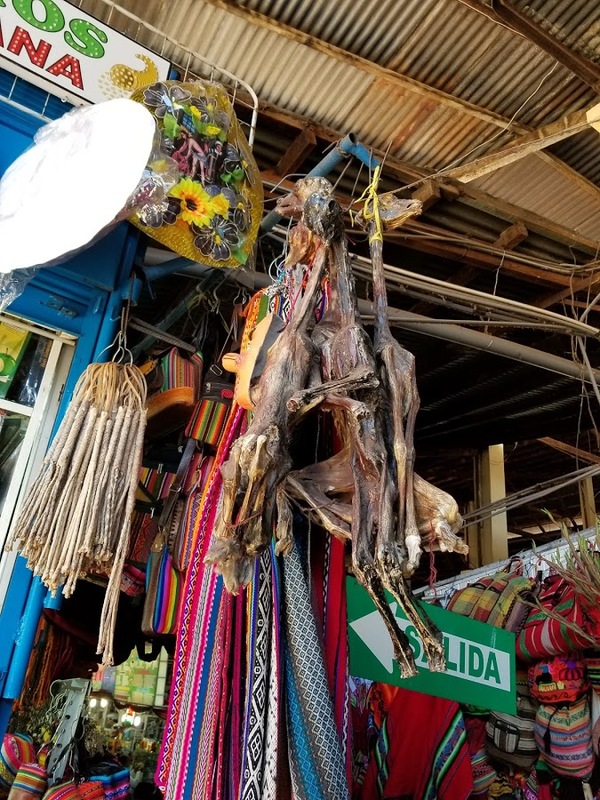 Here's an article that delves into the subject more thoroughly: Inca human sacrifice. What may have been a throne at Q'enqo. Going down into the structure was definitely eerie. In the mummification chamber, our guide explains the practice to Sue. 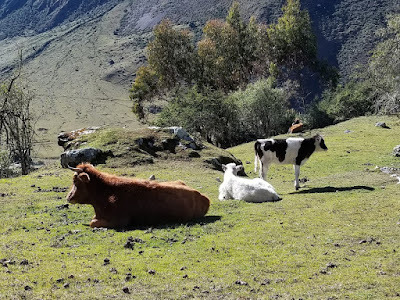 We returned to Cusco in time for a late lunch, and spent the rest of the afternoon wandering around. We headed back to the plaza where the parade was still going on. Here's a short video: Cusco parade. 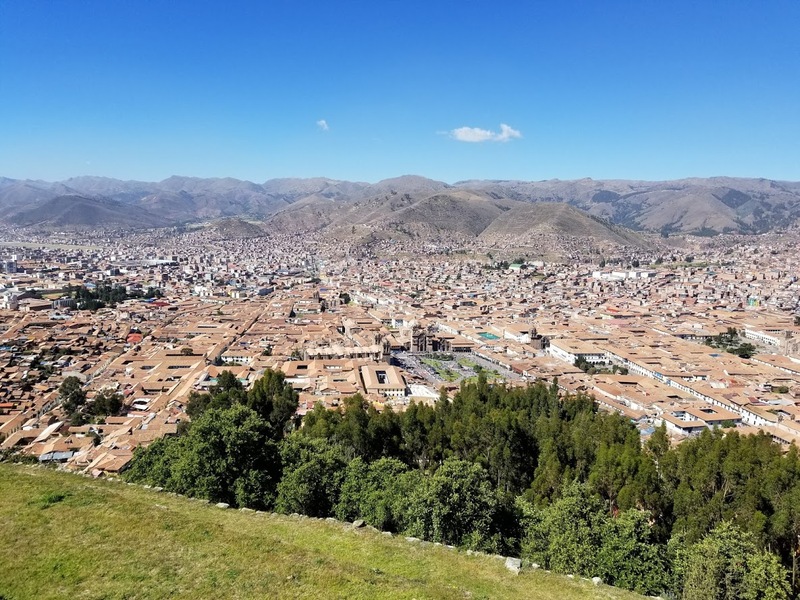 The multi-colored flag that is much in evidence is the Cusco city flag. After dinner we walked several blocks to the El Mercado Hotel for our orientation meeting with our fellow trekkers and our guides from Mountain Lodges. We arrived early and were able to enjoy some ambience in the hotel courtyard around the fire, with a guitar duet performing Spanish- and English-language songs, including several Beatles tunes. 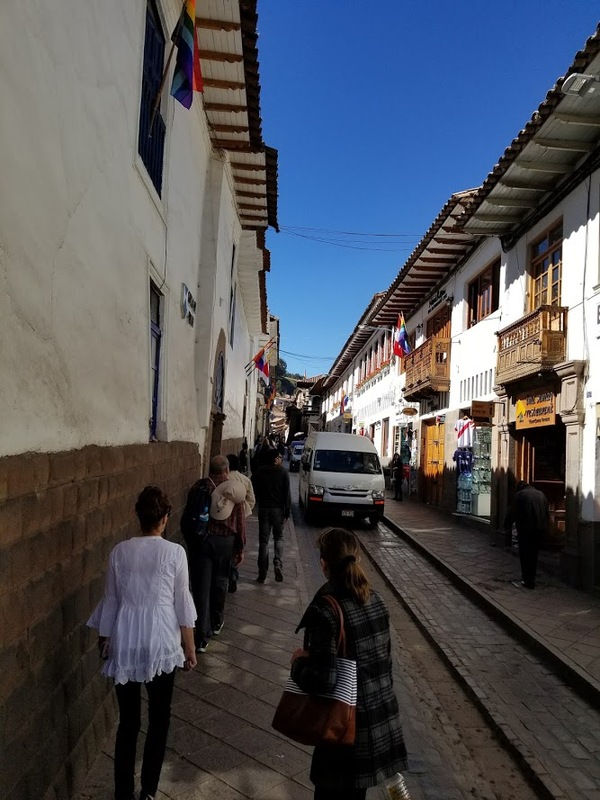 Off the plaza, the streets were narrow and so were the sidewalks. 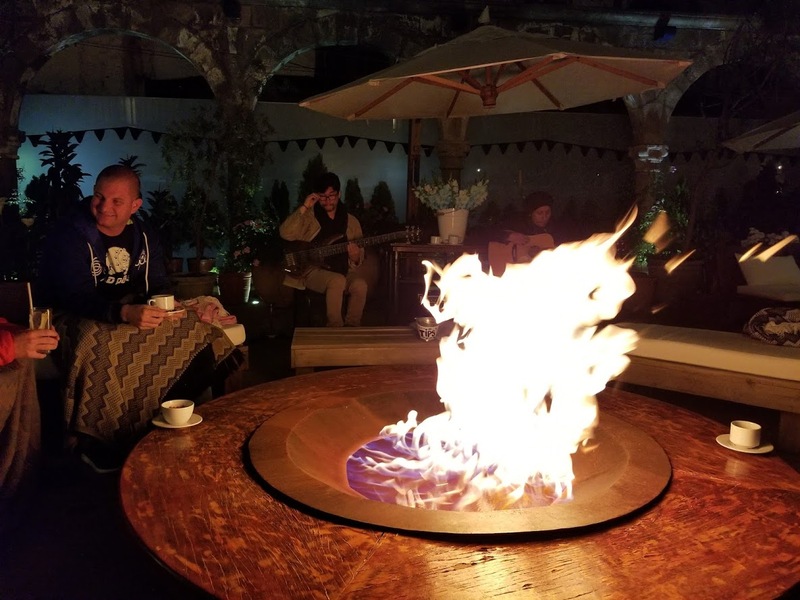 The unique, oil-fueled fire and the music provided a special ambience before the meeting. We were the first to arrive at the meeting but were soon joined by our new friends, who would be sharing the trek with us: Bill and Stephanie Bond Huie from Texas, Jay and Kelly Ohanesian from Arizona, John and Amy Daly from Florida, and two couples from Canada, Dennis and Ingrid Howden from Calgary and Michael and Wendy Wan from Vancouver. 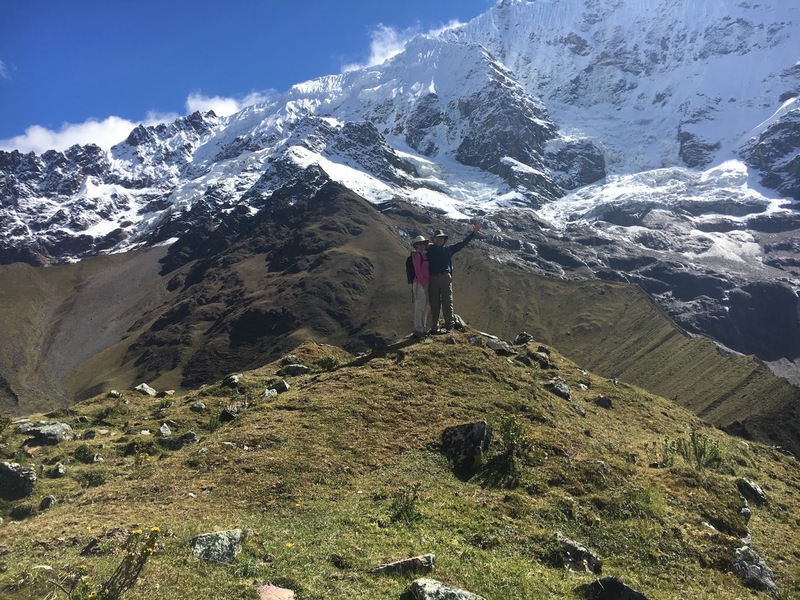 Our guides were Eddie Pizarro and Jimmy Valverde. The orientation meeting was well-organized and it quickly became apparent that our guides knew their stuff. 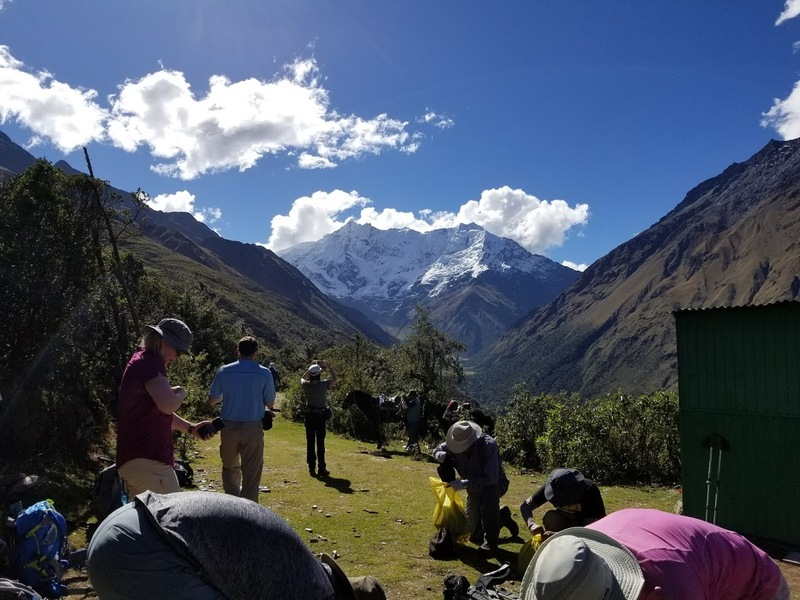 They handed out our duffel bags, which we would pack with up to 22 pounds of clothing and other essentials to be taken on the trek. 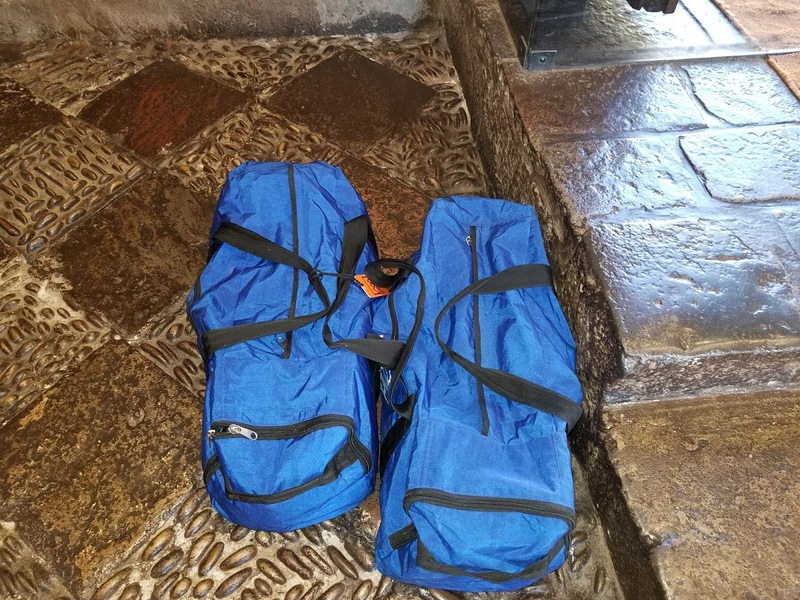 The duffels would be transported by car and horseback to our various lodges; we each had a backpack with 10-15 more pounds of whatever we would want to take with us on the trails. 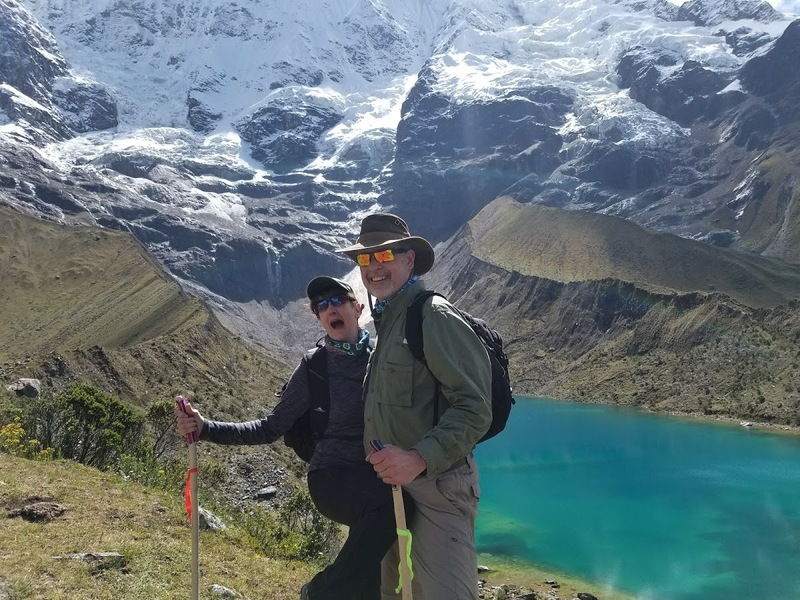 Sue and I had been training with our backpacks on the trails and hills of northwest Wisconsin, but we knew that was nothing compared to what we were about to experience. 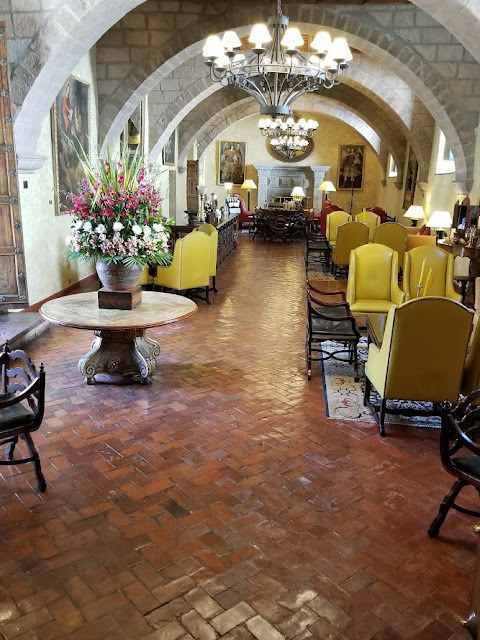 Back at the Monasterio, we packed our duffels and retired for our final night before the start of the great adventure. Eddie and Jimmy would be picking us up around 7:30 the next morning. We were excited, and also somewhat apprehensive. 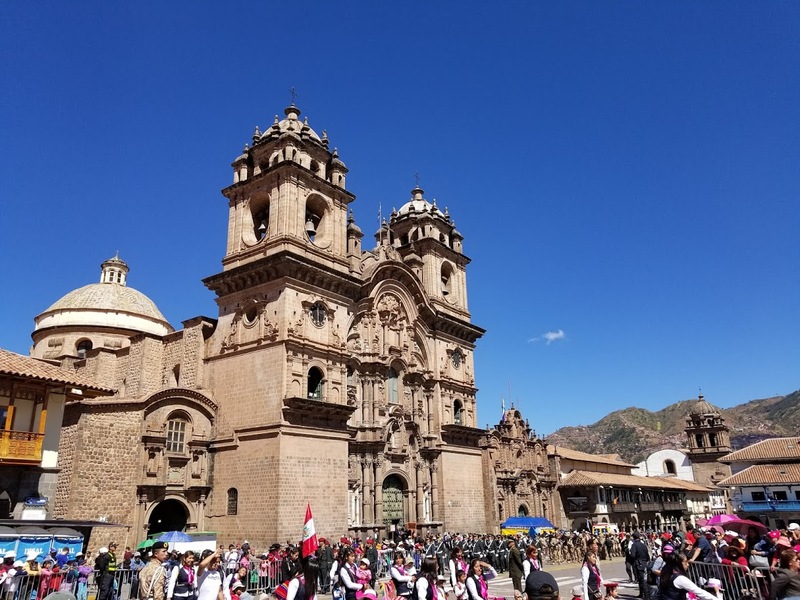 So far, Peru had been very pleasant, but that was in the city of Cusco and its environs. What would the Andes hold for us? We were about to find out. 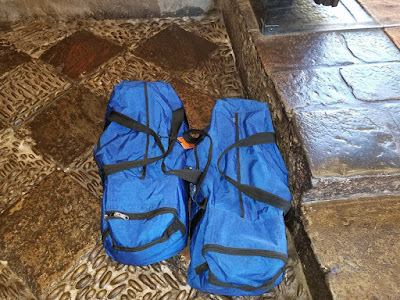 Packed and ready for the Salkantay, our duffels awaited the start of the trek. Since the end of winter, Sue and I had been taking every opportunity to train for the trek. 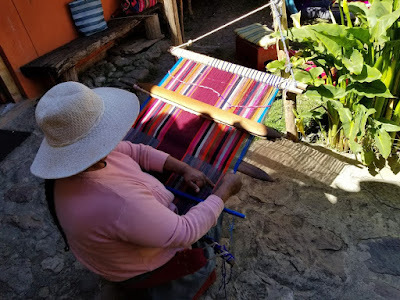 Having undergone knee replacement surgery on December 19th, less than six months before the start of the big adventure, I had to work especially hard. 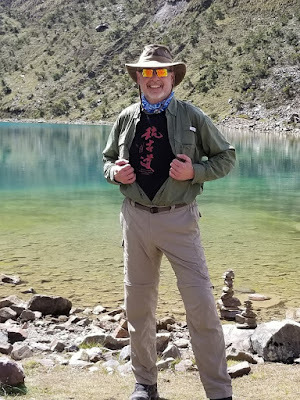 After the mandatory six weeks of physical therapy following the surgery, I started seeing my personal trainer, Tony Bergman of 4everFit in Rice Lake, for another six weeks to get the leg back up to martial arts-level strength. 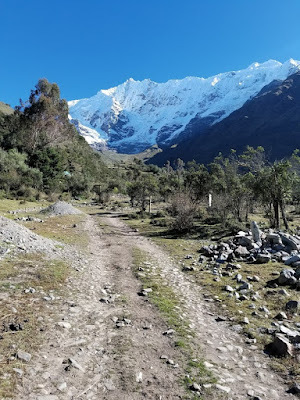 In late April we began another six weeks of weekly training sessions with the goal of getting me into Salkantay shape, as much as that could be achieved considering we could do nothing to replicate the altitude I'd encounter in Peru. The sessions with Tony were in addition to regular visits to the Rice Lake Municipal Pool and to our longtime gym, Olympic Fitness. Sue and I also began hiking once or twice on weekends, picking trails near our home and also ones catalogued by a writing colleague of mine, Rob Bignell, through his books and his website: Day Hiking Trails. 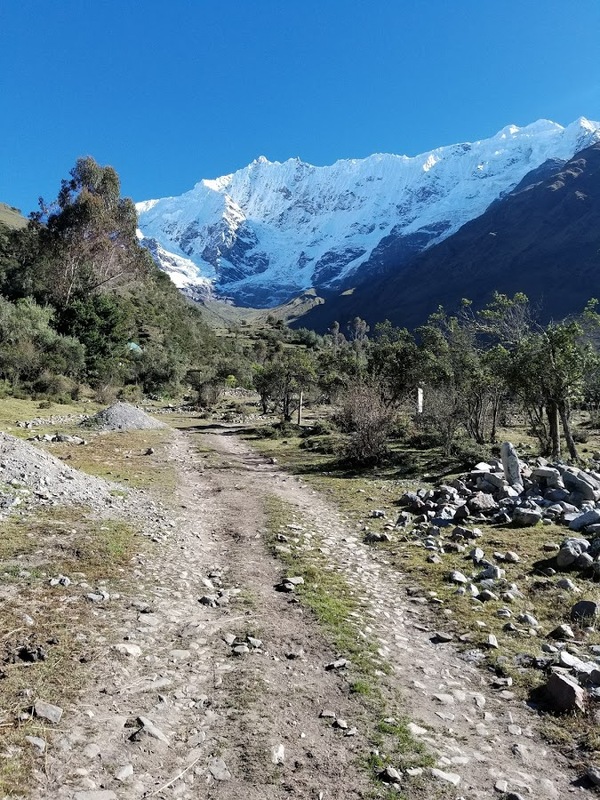 Eddie and Jimmy rounded us all up on a beautiful morning and we headed out of the city to the start of the trek. 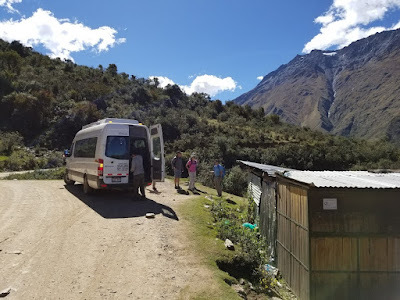 Our goal today was to make it to our first lodge, Salkantay. One of the attractions of using Mountain Lodges as our outfitter was their use of, yes, mountain lodges. 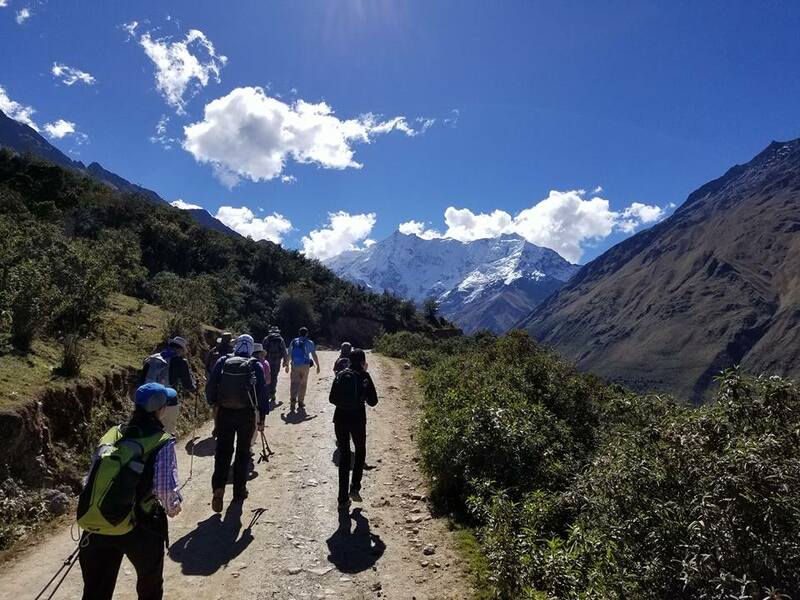 On the way to the lodge, we would be hiking at about 13,000 feet through the area known as Soraypampa. 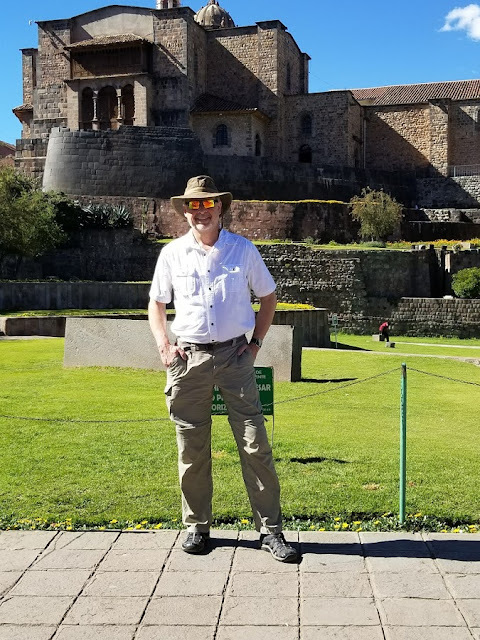 First, though, we stopped at the Inca ruins of Tarawasi. 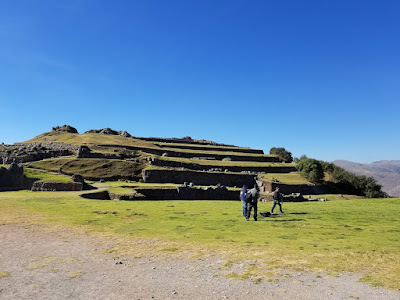 This was a place thought to be constructed during the reign of the Inca ruler Parchacutec in the mid-15th century, well before the arrival of the Spaniards. About 200 years later, Spanish colonists built their own complex here. The defining feature of Tarawasi are the 12 niches, just big enough for a person. In addition to terraces that the Inca used to grow crops, the structures are thought to have been used as a rest stop or religious shrine, maybe both. cactus was one of many often surprising examples of Andean flora we saw on the trek. After our brief exploration of Tarawasi, the group gathers on one of the terraces. Americans, who are used to seeing guinea pigs as pets. master weavers at their craft. Back on the road after the visit to Mollepata, we soon came to the drop-off point for the start of the trek. 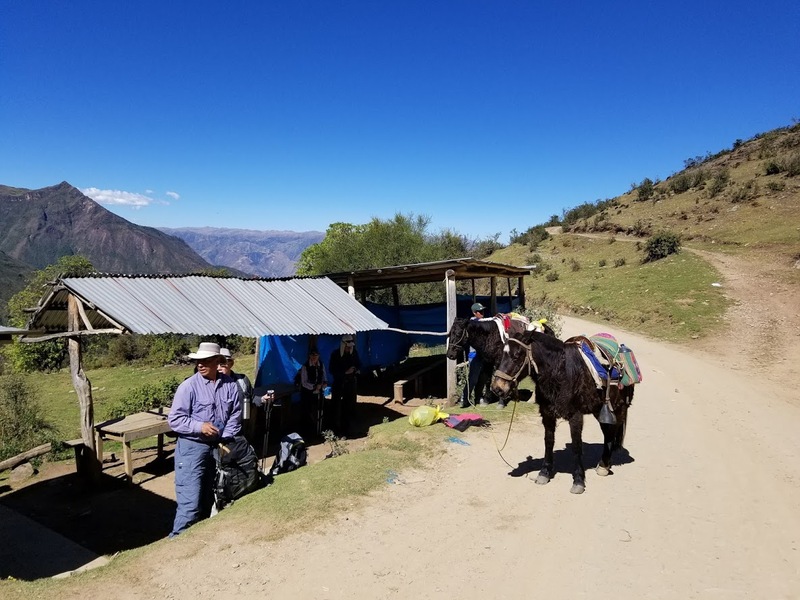 Our vehicle would continue onward to our first lodge, but we would hit the trail, accompanied by a couple of pack horses hauling water and other supplies. We'd been told at the orientation meeting the night before that if a hiker became injured or debilitated by the altitude, a horse would be available to ride the rest of the way to the lodge. But all of us decided that we wouldn't avail ourselves of the horse unless absolutely necessary. We started this first leg of the trek at an altitude of 11,979 feet, and over the next five miles we would gain 711 feet. That doesn't sound like much, but trust me, it is. 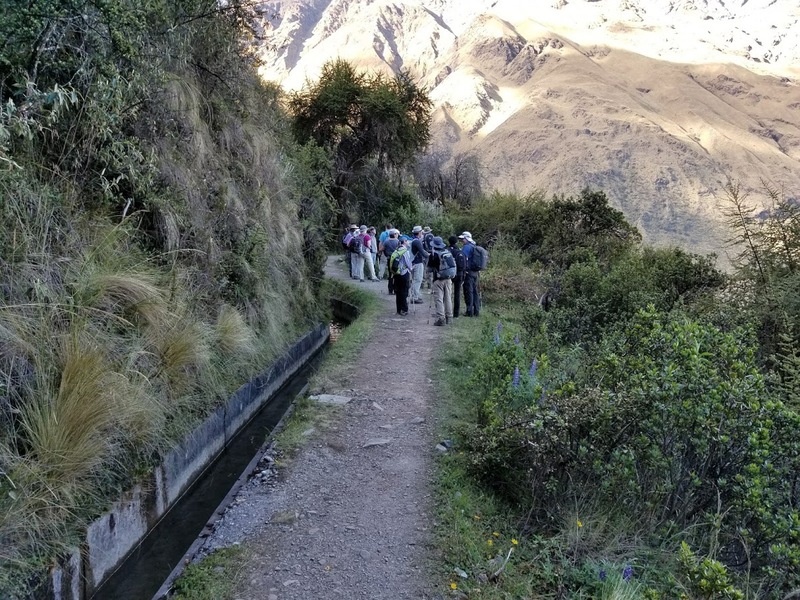 Much of the trail was along an aqueduct that Eddie explained was originally constructed by the Inca and fortified by the Peruvian government over the last twenty years or so. 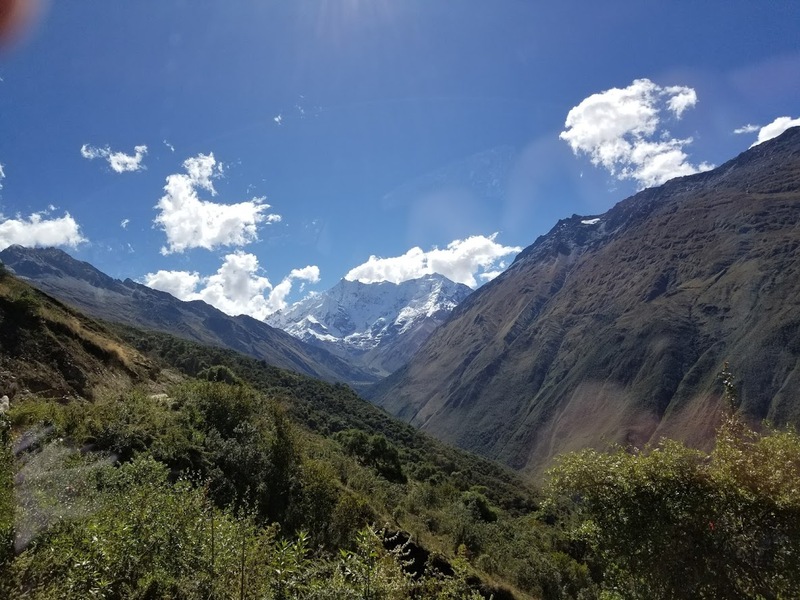 In the distance, Salkantay awaited us. Two days hence, we would be going over its pass. it would become more and more comfy in memory. Eddie makes his final preparations to lead us on the first leg. 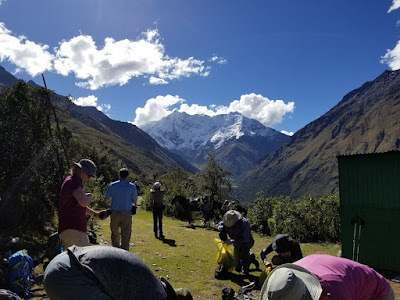 We stopped for lunch after about an hour or so of hiking, with Salkantay looming larger. emphasized the absolute necessity to bring plenty of water and stay hydrated. After about four miles of hiking, our goal comes into view. And yes, it felt good to see the lodge at last. 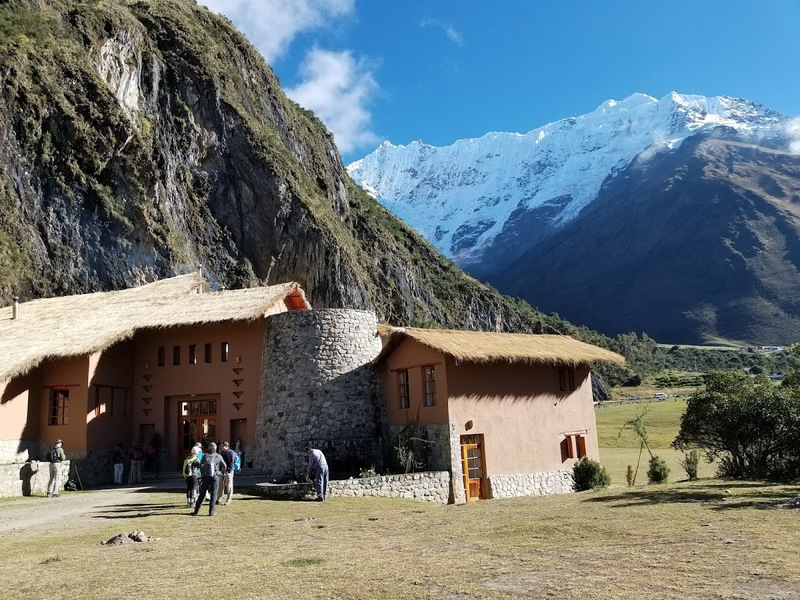 Salkantay Lodge at Soraypampa would be our home for the next two nights. 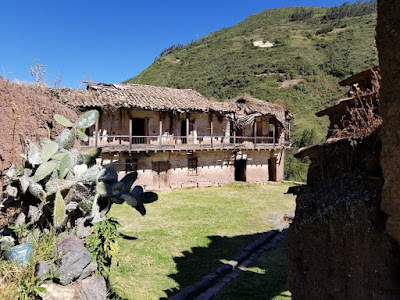 This far up in the mountains, the lodge, like every one we would visit except for the last, had indoor plumbing, but electricity was supplied by generators. Power would shut down at 11pm and go on again no later than 6am. The lodges were resupplied mostly by pack mules and horses. Everyone had made it through the first leg of the trek in great shape. Most of the group were experienced hikers already, and some had even scaled mountains. Clearly, anyone who signs up for this experience would know going in that being in good physical condition was a must. My recently-repaired knee had worked like a charm; my only concern, really, was how my right foot would handle the stress. Four years earlier I'd had surgery on it to repair the peroneal tendon, which had been damaged by years of martial arts kicks. The repair was holding up, though, and I was encouraged. And encouragement at this stage was good, because the next day we would be embarking on our first real ascending stage of the trek. The guides billed it as an "acclimatization" hike, so we could experience an altitude that would be close to what we would ascend to on Thursday, when we would assault Salkantay Pass. Today, to get ready for the pass, we would go to the lake. There was some mention in Mountain Lodges' documents, which we received well in advance of the trip, about optional horseback riding in place of this hike, or a shorter ride in addition to the hike. I like horseback riding, and started thinking that riding horses on six continents would be a good bucket-list item. After riding in Tibet the year before, two continents were checked off, and riding in Peru would make three. But as we gathered at the lodge on Tuesday night to discuss the next day's activities, the ride to the lake was not brought up. I finally asked about riding, and Eddie said that if enough people were interested, there would be a ride available in the afternoon after we returned from the hike. Where to? Well, just the roads nearby. That didn't sound too terribly exciting, so I passed on the ride, and everybody else did, too. Good thing, because after hiking up to the lake and back, we didn't have much energy left. We set out on a beautiful but chilly morning right after breakfast. We would be hiking four miles and it took us about four and a half hours from start to finish. The trails the day before had been only moderately challenging, in terms of terrain. That was about to change, and drastically. 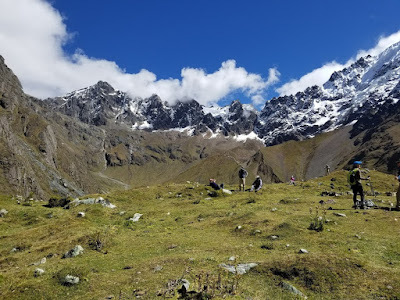 These trails, and those we would traverse the next few days, were extremely challenging: often narrow, always rocky, and, when we were on mountainsides, always featuring rather steep drops. And, of course, no guardrails or handholds anywhere. 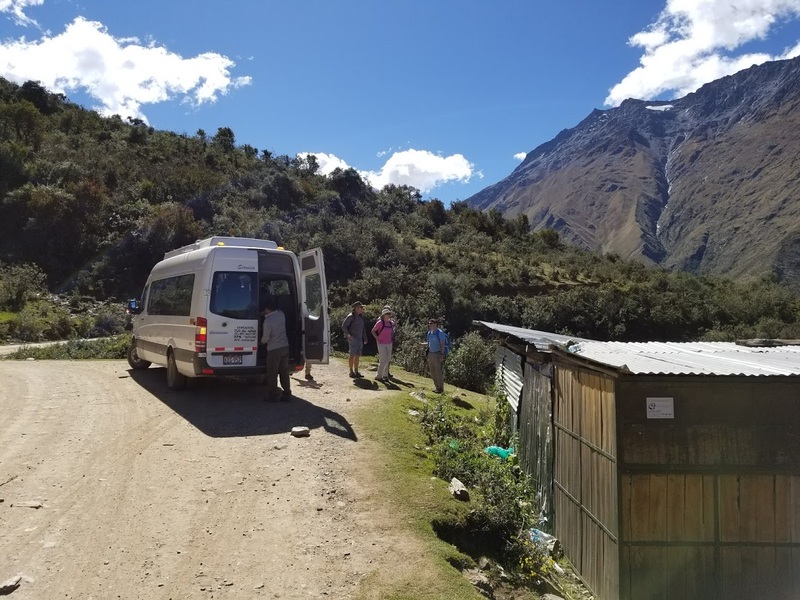 Outside our lodge, the day greeted us with sunny skies and chill temps. would be from here on out. 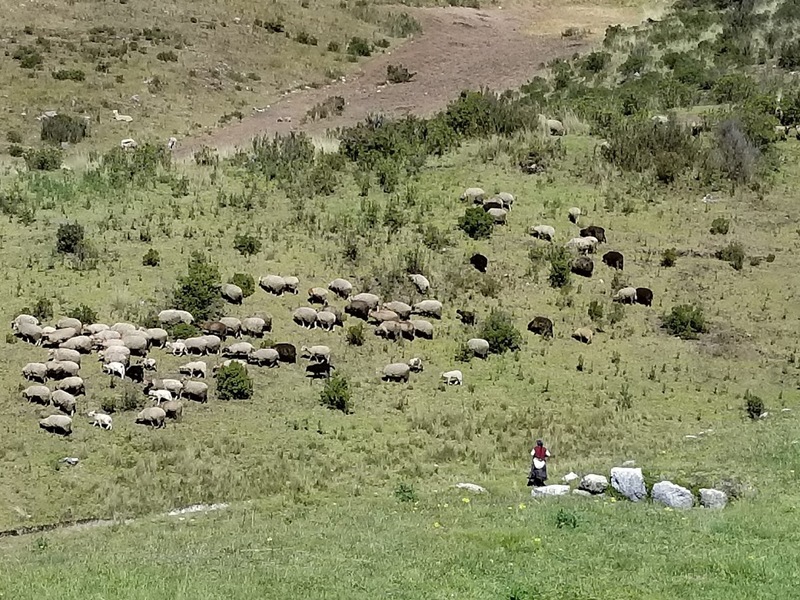 Even at elevations over 13,000 feet, cattle were grazing. 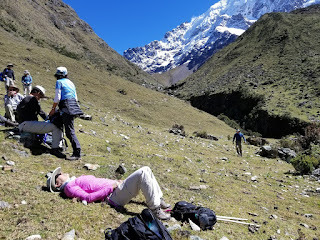 About an hour or so into the hike, it was time to take a break. Sue stops to take a shot of our fellow hikers crossing a mountain stream. At last, we arrived at the highest elevation of the hike, overlooking Lake Humantay below. scenery was stunning, to say the least. take a new photo every few yards. Sue sometimes can't restrain herself when we're having fun. Previous hikers had left cairns at the shore, making for good photo opps. 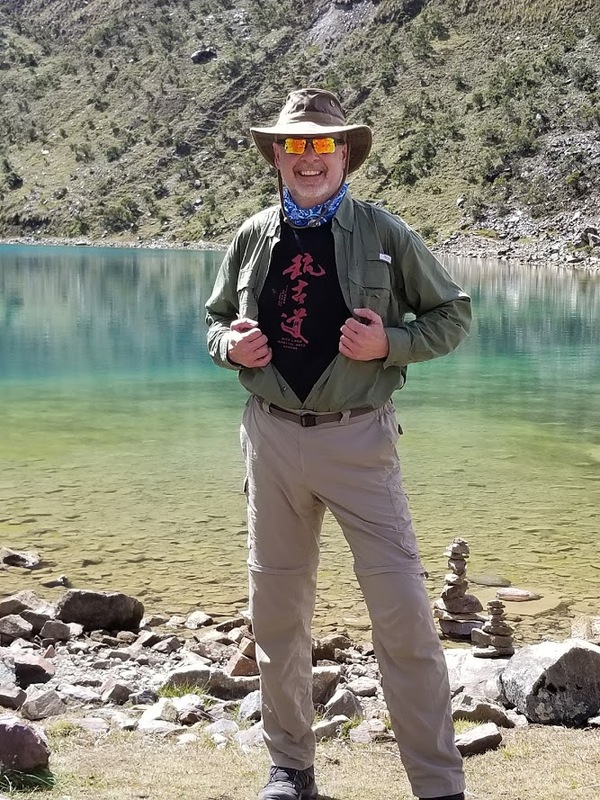 On her travels, Sue likes to post "Travel Leaders Insider" videos, and here's the one from the lake: TLI at Lake Humantay. Eddie asked if anybody wanted to go swimming, but there were no takers, not even anyone willing to take off boots and socks and go wading. It looked tempting, but with all the rocks I could see under the surface, there was no way I was going to tempt fate. So far I had handled the rocky trails all right, but I was well aware that my repaired foot has little tolerance these days for uneven surfaces. A bit sad to leave the beautiful lake but thrilled at our accomplishment, we headed back toward the lodge, taking another route down. more difficult than climbing. But we all made it. 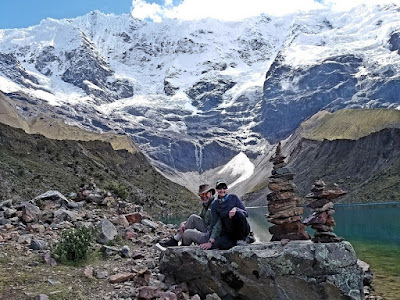 We returned to Salkantay Lodge in good shape and exhilarated about the morning's hike. For the rest of the afternoon, we did just that: rest, along with some socializing and hot-tubbing as well. Everyone dined together at one table, and the camaraderie of the group really began translating into bonding at that point. The Korean martial art of taekwondo, in which I'd earned a black belt in 2005, has five tenets, none of which have anything to do with fighting. The fifth, and perhaps most important, is indomitable spirit. It was this spirit that carried me, and indeed all of us in the "Salkantay 12," to Lake Humantay on this sunny June day in Peru. But the next day, that indomitable spirit would be tested as never before. 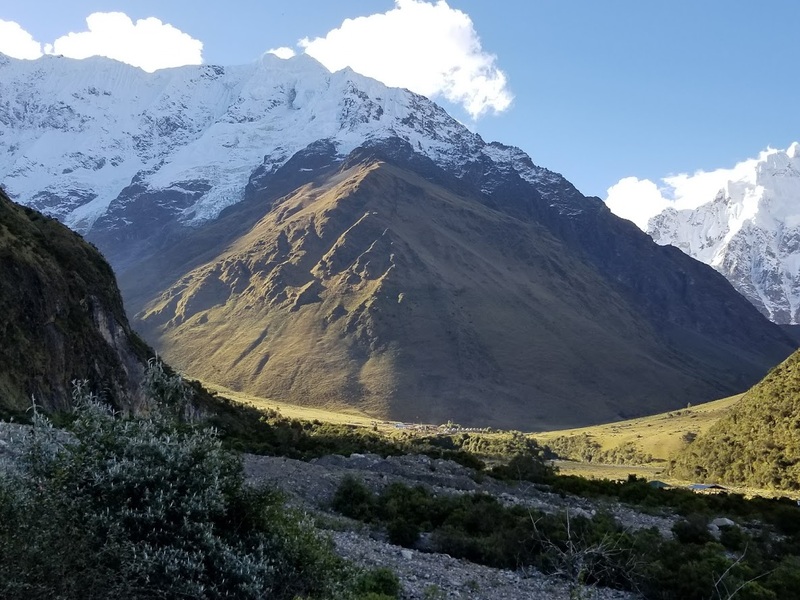 We would be hiking eight miles to our next lodge, and in the middle of that hike we would encounter Salkantay Pass, at our maximum altitude of 15,213 feet. Would we make it? As we hit the hay on this night, all of us were wondering. Stay tuned, Part 2 is coming soon! After having a long trip, it is good to take some rest at a hotel to get refreshed. 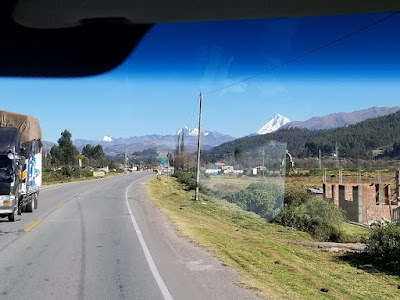 Thanks for sharing a nice travel post.